Galantyne Cimbora..lovingly know as Darcy. 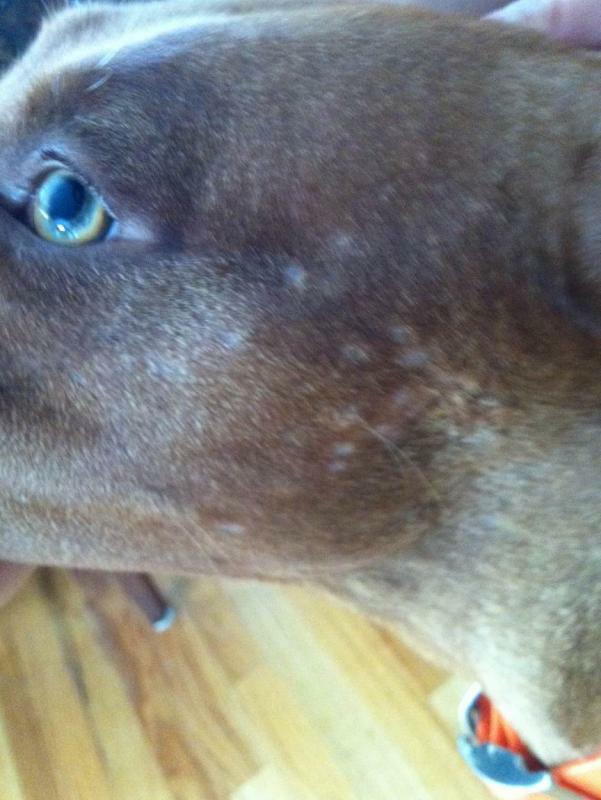 If your dog had any swelling from bug bite, hives in the past on the spots where the hair fell off, and the skin looks in good condition then its normal. Nothing you can do and the hair will grow back. If its red or crusty or there is more spots appearing then it could be a number of things. I would change vets if I had to wait three weeks for lab work, or find a different one to use in emergency situations. I'm not downing your vet in anyway but sometimes time matters on diagnoses and treatment. I doubt this is one of those times but look for one that does in house lab work before your ever faced with a serious problem. 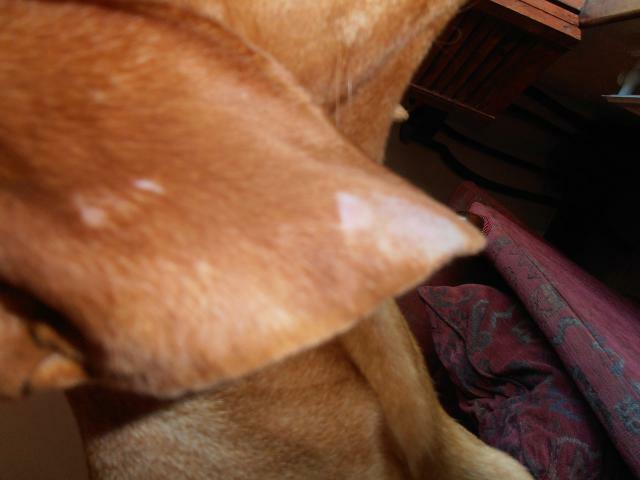 If so, my dog is suffering the same thing - she has little white spots on her head & left cheek. We noticed raised bumps on her cheek & one one on her head 2 weeks ago (about 10 of them) - I thought they were small cuts from running through the woods. When they healed, her hair fell out. Turns out, it looks like it's allergies to something. She has a ton more raised bumps on her neck now (she'll lose her hair there too I guess....) & she has welts/hives on her tummy (that part is brand new). It's probably bug bites, small cuts or most likely bumps from allergies. See this thread I started a couple of days ago. It is probably somewhat related to your problem. Thanks for contacting me, Darcy started with 3 little pin pricks on her ear, it then began to swell up and now its gone a bit bald.She aslo has some on her chest,about the size of 20p I have posted a photo of her ear I hope it gets through as I am still learning to post photos....thank you. My V had the same thing. I went to the vet and turned out its just allergies based on the season. He would get little bumps then when they went down or disappeared hair would fall off. They recommended giving him a pill of Benadryl. Works every time. i concur with jaclyns. some benedryl can't hurt and will likely solve the problem. I received Darcy's blood results yesterday and her thyroid level is fine, her hair loss is also not down to mange as that came back negative...we are now just waiting for skin scrape cultures, but the vet thinks its some form of allergy,I think its down to her running through the long grass in summertime as it appears to be the front of her that's affected...chest ears etc. There seem to be quite a few of us that are finding that our Vs are coming up with hives at the moment. Boris has had hives all over his body, but most of the time his ears, eyes and nose are swollen and red. My vet suggested just trying to find out what Boris is allergic to by process of elimination. He said he could run tests but the likely hood of finding what he is allergic to were slim. At the moment in the UK everything is flowering and pollen is high including the grass - we think that he has an allergy to the seed in the long grass. He is on Piriton 3x a day but we notice that all is fine when we come down in the morning but within 1hr of him going into the garden his ears are red inside. We think they come into contact with something that irritates them???? Today we took him on the Surrey Vizsla Whizz at Pirbright and he was running through ferns and grasses and I did notice he had some hives on his shoulders. I would be interested to know the results of the skin scrappings.